Sometimes life gives you lemons. Sometimes it gives you gold bars. This is one of those gold bar moments. It started with an email from reader and fellow SAPFM member Dave Macrae. He's also a member of the Guild of New Hampshire Woodworkers, and said their Period Furniture Group had a program I might be interested in. Al Breed, also a Guild member, has offered to do a special series of presentations demonstrating building a reproduction of a John Townsend document chest. The original chest is in the Chipstone Collection at the Milwaukee Art Museum. 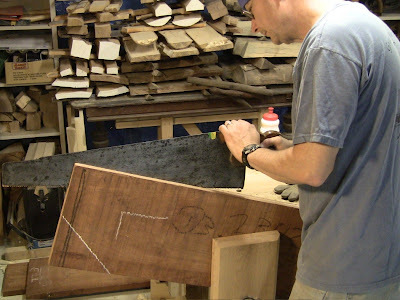 Townsend is renowned as one of the finest of the Newport cabinetmakers in the Federal period. 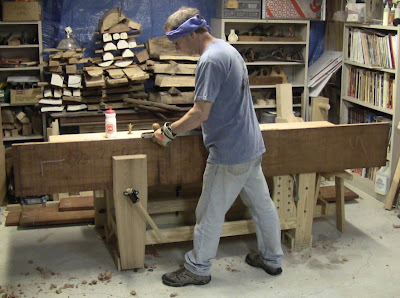 Al is himself renowned as a museum-quality period furniture maker and teacher (he's also a SAPFM member, always active on their online forums). At no cost, he'll be conducting one 3-hour meeting every two months. The whole project is expected to take up to two years. He's also offered his plans to participants at half price. 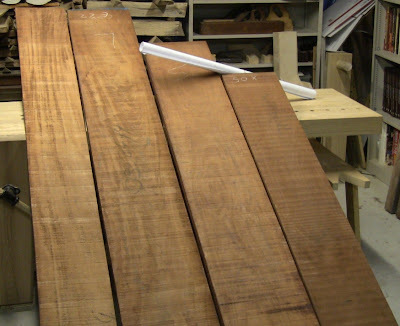 As an additional bonus, Guild member Roger Myers offered to put together a group buy of mahogany from Irion Lumber, a superb supplier of high quality lumber in Pennsylvania. Their minimum order is 150 board feet, more than most hobbyists can manage on their own. This would allow participants to build along at home, since this program is demonstration only, not a full-blown class. When I read through this, I replied to Dave that I'd have to be insane not to participate. I had taken a ball-and-claw carving class from Al last year, so I knew what an amazing opportunity this was. Al is incredibly knowledgeable, and amazingly generous with his knowledge. This further confirmed my opinion of him. Even though Guild programs are open to non-members, I promptly joined, because this is clearly an outstanding organization, with outstanding programs and outstanding membership. It's not limited to NH residents; Garrett Hack of Vermont, one of my favorite woodworking authors, is also a member. I immediately contacted PFG leader Michael Brown to sign up for the program. It's a good thing I didn't delay. Apparently the response was overwhelming. Because of limited space in Al's shop, it's limited to 30 people, so I was lucky to get in. Then I contacted Roger to participate in the group buy. Thanks for the head's up, Dave! I also contacted Al and Michael about shooting video of his presentations, with the plan to edit them into a DVD for sale. That would allow others to benefit from the program. Knowledge is like peanut butter, it's best when spread around! Roger and Michael were worried they might not get enough interest to meet the minimum lumber shipping requirement. Not a problem. He ended up ordering lumber for 22 people. The day before hurricane Irene hit, 3200 lbs. of lumber arrived at his house, which he and several volunteers split up into kits and stored in his garage. He also ordered a little extra in case anyone had any mishaps. I arranged to pick up my kit after the first meeting. That took place yesterday in Al's shop in Rollinsford, NH, drawing participants from four states. Al's method for the meetings is to use various parts left over from his regular document chest class. He apologized for the fact that these are all rejects with some kind of mistake or defect, but they served quite well. His focus was not on basic skills, but on the specific details of this chest and the special challenges they present, so he skipped right to case assembly. This project is definitely a challenge for most of the participants. That's how we progress. A huge thank you to Al, Michael, and Roger for this! It is a truly spectacular opportunity, showing why you should join your local (and no-so-local) woodworking organization. 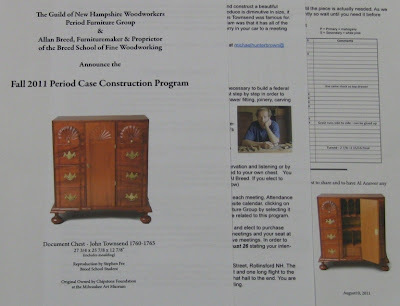 The Guild mailing, showing pictures of the Townsend document chest built by Stephen Fee at the Breed School, along with a cut list. 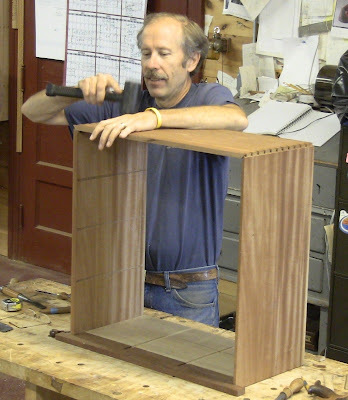 Al dry-assembling the chest case. Look at the figure in that mahogany! 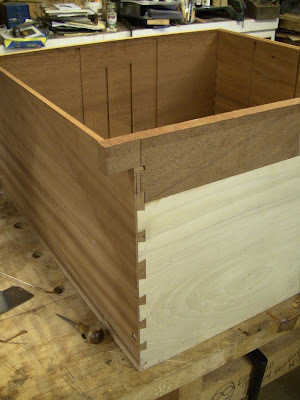 The top features half-blind dovetails, mitered at the front. Townsend didn't skimp on construction quality. Some case details: half-blind dovetails on the bottom, which is composed of a mahogany facing and pine secondary wood; various full and stopped dadoes inside for horizontal and vertical dividers. 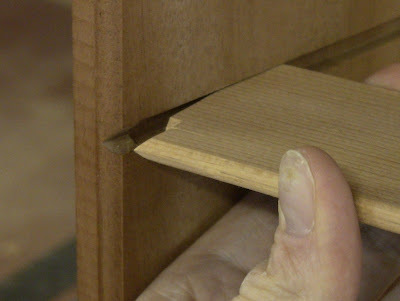 Closeup of one of the fine details: a sample pine divider fits into a stopped dado with a V-notch chiseled into the front. The divider is scribed to the notch and trimmed to fit. Since the profile molded onto the divider front matches the profile molded to the edge of the side, this gives the appearance of mitered corners at all divider joints. Go easy, don't force the piece through the blade. That will cause the blade to wander on the bottom edge, ruining the thickness. He had several parts exhibiting this defect, though it can be hidden by orienting the part to the inside and rear of the case. 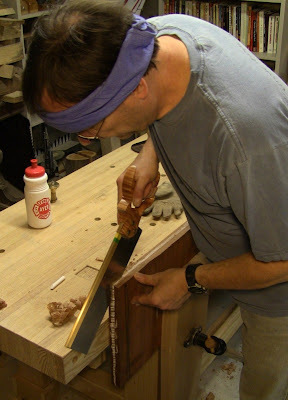 Run down each edge on the table saw with the blade at maximum height to do a partial resaw. This leaves a smaller amount of wood to resaw in the middle, and the blade will follow the existing kerfs. Rip the board into two or three narrower pieces, resaw them individually, and reglue the resawn widths back together. The glue line will be virtually invisible. Resawing the narrow pieces is much easier, and allows them to be done on a smaller bandsaw, or possibly entirely on a table saw. 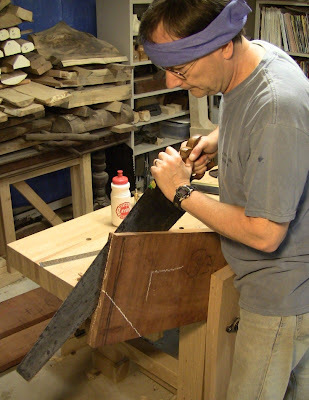 The last two tips can also be used when resawing with hand tools, either ripsaw or frame saw. Today, I started the task of resawing the lumber for the main case with a hand ripsaw, which is a lot of work. It's worth mentioning at this point that if you're not used to this kind of heavy physical labor, you might want to do it a different way. I suspect that in the days of old, it was the young bucks in their 20's and 30's who did most of the pit-sawing. A little foreshadowing: I started out resawing an entire board, but as you'll see in part 2 of this series, I came to my senses and switched to breaking the board down to shorter lengths first, then resawing. Other than the length being resawn, everything that follows still applies. Back in my shop, my load of mahogany and copy of Al's plan. This is $341 worth of fine lumber. 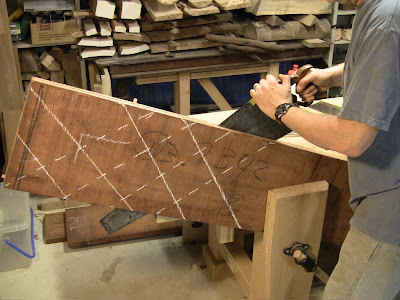 Look at the figure in that ribbon-stripe mahogany, even in the rough state! Jointing a rough edge so I can mark it for resawing. Notice the headband and water bottle sitting on the bench: this is going to be a lot of work, no question about it. Take lots of breaks, pace yourself, and be ready to sweat. Break it up over several work sessions. As Roger said, this stock is a generous 4/4. 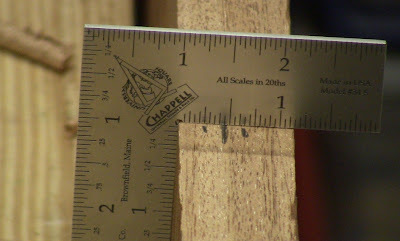 To find my cut line, I measured 1/4" from one side, 1/2" from the other, and split the difference. That should allow some margin for error. Then I scribed that line with my Tite-Mark, went over it with chalk, and re-scribed it. That left a good visible line. I repeated this on the other edge and the end grain. Starting the corner with a backsaw. Establishing a good starting kerf is critical. Then I went to work on the corner with a full-size ripsaw. Keep the saw waxed to minimize friction. Don't force the cut; let gravity and the teeth do their work. Once the first corner was well-established, I flipped the board and repeated the process on the second corner. I've marked where I stopped on the first corner so you can see how the operation goes. 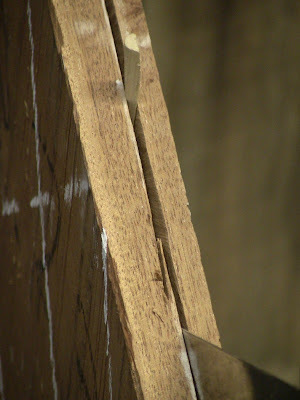 Because the first corner has been cut, it leaves a relief kerf for the saw to follow, and reduces the amount of wood in contact with the saw teeth. Repeat this down the length of the board, flipping it every few inches. This will maintain control of the cut and produce a consistent thickness. The trailing portion of the sawplate rides in the cut like a rudder to guide the leading edge, though the teeth can still wander. 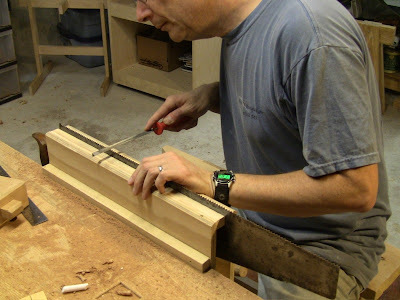 To extend the cut down the length of the board, drop the angle of the saw for shallow, long sawing. This also allows you to steer it and correct any top-side wander. Once you get to a full-width cut, it's a pretty straightforward operation. You do have to keep a constant eye on the saw exiting the bottom edge; it can still wander despite the relief kerf. The rest is just labor. After the second flip. I've marked the previous progress on this side with a dotted line, and the progress on the opposite side with a solid line. You can see how this is just a matter of taking down corners, minimizing the solid wood being cut at all times; it's basically like sawing a giant tenon for the entire length of the board. 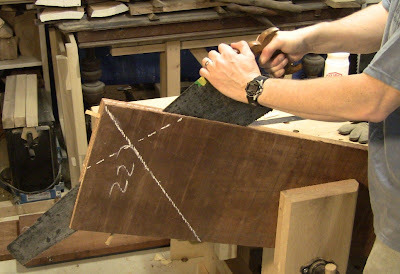 It's also necessary to insert small wedges in the cut as kerf-keepers, otherwise the wood will close up on the saw. These are just visible in the end of the board and the bottom side. Good progress after a number of flips. I was taking 30-45 minutes per foot, so an 8' board is a 4-6 hour job. Not something I want to do a lot of, but it's definitely possible to do by hand. Here's what happens when you get cocky and don't pay enough attention to the bottom side of the board. The saw wandered a bit, despite the relief kerf, just like the bandsaw problem Al had warned us about. I tried to correct it from the other side, but then I was getting the same problem on the opposite edge. So I stopped before I completely ruined it, and started fresh from the other end of the board. This was a good time to sharpen the saw. This job is a lot of wear on the teeth. The sharpened saw was binding heavily, so I set the teeth lightly, since I hadn't done it for the last several sharpenings. This looks tedious, but it's actually pretty quick, guiding the sawset along the existing set remaining in the teeth. 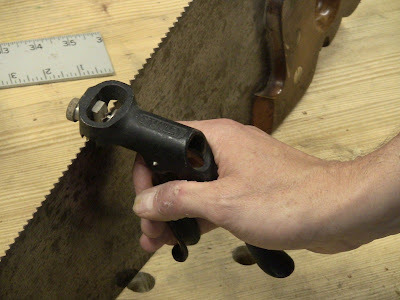 The increased set made the saw clear the dust from the cut much better, eliminating the binding. A final note: several people at the meeting expressed interests in the holdfasts Al was using. These were the commonly-available cast holdfasts, which I don't like. 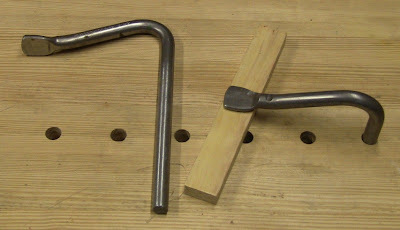 As far as I'm concerned, unless you have a blacksmith who can make you wrought-iron holdfasts, the only commercially-made ones worth owning are the Gramercy Tools holdfasts from Tools For Working Wood. Buy them by the pair; buy two pairs to spread the shipping cost. The price is reasonable and they're well worth it. I have 3 pairs of these Gramercy Tools holdfasts; they fit in 3/4" dog holes. They're made of drawn steel "wire" so they have just a touch of spring to them, and you can beat on them like mad without fear of cracking, unlike cast holdfasts. Spin the shafts a bit in sandpaper to roughen them, and they hold great. So how did the resawn wood turn out? I'll have to get back to you on that. After completing two-thirds the length of the board, I was pretty tired. Better to leave it for another day than wear myself out completely or injure myself. What a great project Steve! I can see you will create an heirloom from that beautiful lumber. Thanks, Bob! Yes, I had your boat-plank resawing in mind when I did this. That's part of what inspired me to try resawing the full length. However, that may be overly ambitious when it's not really necessary. Boat planks need to be long, but these pieces don't. It probably makes more sense to break things down into manageable lengths first. Do what you can to reduce the job as quickly as possible, turning it into multiple smaller tasks rather than one big one. I did think a few times as I was sawing it would be nice to get over the work more as you suggest. I'll give that a try. You didn't say the length and tpi of the saw you used ... or rake angle. Can you remember back that far? The saw is 26" from toe to heel, 6 TPI, zero rake. Just be sure you read part 3 of this series, with the photo captioned "When good resaws go bad"! Resawing a 12"-wide piece of mahogany was perhaps a bit too ambitious. The solution is to rip it, resaw the rips, then glue them back together, much like making a guitar back, so that's what I did in part 3.